This morning, as I was driving my daughter to work, I was about to make a left turn to the other lane. A white car sped toward me. Apparently, the driver was trying to beat the red light by speeding away. Seeing me making a turn, he rudely honks at me, as if he is saying, "Good grief! Can't you wait?" Huh? Hello? Who is being impatient here? The incident left me thinking, at first, how impatient that driver was, and how hypocritical he had behaved. On second thought, I sensed an inner unhappiness within me. Why am I feeling what I am feeling? Ok. That man had driven dangerously. He had interrupted my morning peace. Having done that, what remained is my inner response. How I respond determines my capacity of becoming slow to anger. Indeed, some of my thoughts also include the wish that a policeman will flag down that driver to give him some demerit points.This week, I like to reflect on the words, "slow to anger." It is not difficult to read about angry people these days. Hockey players often get into a brawl during an official match. When the stakes are high, fists readily fly. In one game, nearly the whole team came to blows, and the game continued to be disrupted by fights. When teams of players are angry, hurting comes first, playing is a distant second. Anger Management is not simply about techniques or psychological clinics. In 2003, it has also been made into a film called "Anger Management" for entertainment purposes. Behind each shooting incident in schools, each rude honk of the vehicle, of any loud curses, is a heart growing with anger. In fact, anger is such a common occurrence that it has spawned a whole industry simply trying to help people manage anger. Following the Occupy Wall Street protests last year, PBS has also made a documentary entitled, "Are Americans Getting Angrier?" Perhaps, the popular tablet game, "Angry Birds" has been created to use birds to poke fun on this perennial human problem. Hurting your relationships with your family and friends." KEY POINT: All of us have an anger problem. The difference is how much. The game, "Angry Birds" is a highly addictive game. 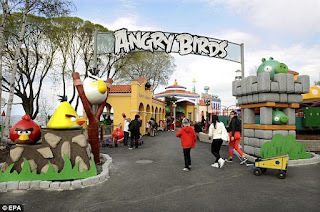 Freely available on the Internet for many different platforms, it has become so popular that even one Finnish city has created the world's first Angry Birds theme park based on the game of the same name. The game is simple. With a limited number of birds of the left side, one tries to bowl over, destroy, or free some of the caged or trapped characters on the right side of the screen. Clever techniques and skills are needed in order to use the minimum number of birds to clear each level. As one advances in levels, the game gets more difficult and complicated. All the birds used have this common characteristics: An angry face. It seems like the creators of the game intends to use anger for good. The angry birds are ready to be used to achieve a certain goal. That keeps me wondering. Is this a metaphor for how humans can be made use of? In the game, all the angry birds are pawns, ready to let the game player do what they want with the birds. The birds are vulnerable, and cannot control themselves. The game player is in control. What about us as humans? When we are angry, likewise, we become vulnerable to the control of other people. We get used. We get abused. We unwittingly let our anger control us. The Angry Bird Phenomenon is essentially this: Like, the birds, when we become angry, we give up self-control, and in the process let others control us, and use us for their ends. KEY POINT: When we are easily angered, we easily lose self-control. The desert father, Abba Ammonas himself admits that it takes him 14 years of intentionally just asking God to give him victory over his own anger problem. Another wise teacher, Abba Ninus says that "Prayer is the seed of gentleness and the absence of anger." Seneca, the first Century Roman philosopher says: "Anger, if not restrained, is frequently more hurtful to us than the injury that provokes it." In the same light, we may not be able to contain other peoples anger, but we sure can do something about ours. People are often seen as walking dynamites. The popular phrase, "This guy has a short fuse" is a reference to short-tempered people who are easily angered, quickly offended, and downright impatient. Someone recently told me that people are more ready to accept lots of praises, hugs, and kisses. When it comes to saying things negative, anything that is not praises or nice words, don't! Don't use emails. Don't use third parties. If possible, don't! KEY POINT: Managing anger requires wise responses. Are Christians people who are easily angered? I hope not. Yet, the news I read daily shows more angry people than usual. Maybe it is the media trying to generate controversy. Maybe, it is the fact that bad news sells better. Maybe. Yet, I believe Christian leaders need to learn to lead by example. Christian leaders need to be quick to listen, slow to speak, and if I may add, not easily angered. Leaders cannot be easily offended. Instead, leaders must be quick to give others the benefit of the doubt. They need to be humble to accept the darts of accusations, without the readiness to throw back a bigger dart or a nastier accusation. Leaders need to demonstrate lowliness and humility, that they are imperfect too. Proverbs 19:11 says it clearly. By discretion, the wise man is slow to anger. He delays any negative reactions. He stops his own temper from rising. He directs any unhappiness or doubts straight to God in prayer. Over time, as the news settles, and as the temperatures cool, he will be able to see things with a clearer eye, and to think with more gracious thoughts. On top of resisting retaliation, and to give others the benefit of the doubt, he is ever ready to overlook any transgressions against him. Let me close by suggesting that every time we hear something negative from anyone, use the S.L.O.W acronym to remind us about Proverbs 19:11. Seek God: Learning to seek God for help is an important first step. The proverb teaches us to be discerning. In every Christian discernment, it is always about seeking God, to ask to see from God's perspective rather than ours. "Ask how is God asking me to respond?" Lowliness: Let God show us that we are not as high and mighty, righteous and pure as we like to think. The step of lowliness is often the right step. It aids in keeping ourselves in our own proper category, that we are people forgiven by God. Let us behave as forgiven people, beginning with lowliness. "Ask God to teach us the way of humility in every response. Can I learn to respond with humility? Others first: Ask for the opportunity to put the interests of others above our own selves. It is not the almighty "I" that is always right, but how to see to the interests of others first. "Ask in what way can we bless and help others become better people?" Wisest: What is the wisest thing to do or not to do? Learn to ask how we can be willing to bring out good out of the whole situation. Ask: "What is the wisest way to respond? Maybe not responding angrily is a good default step." Be slow to anger, abounding in love. The Lord is slow to anger, and quick to abound in love. May we as His children do likewise.